Kathmandu, Pokhara and Chitwan Tour provides you the glimpse of Nepal's history, art, cultural heritage, natural wonders, magnificent Himalayas and jungle safari. Kathmandu is the home of ancient temples where you can find the living goddess Kumari. Similarly, Pokhara is the heaven of natural wonders like lakes, caves, waterfalls, and mountains. Likewise, Chitwan is the shelter of endangered wildlife like one-horned Rhinoceroses, Bengal Tigers and much more. This grand tour commences with a world heritage tour of Kathmandu Valley including Pashupatinath Temple, Boudhanath Stupa, Swoyambhunath Temple, and Durbar Square of Kathmandu. Alike, view the sunrise from Nagarkot over the snow-capped huge mountains. 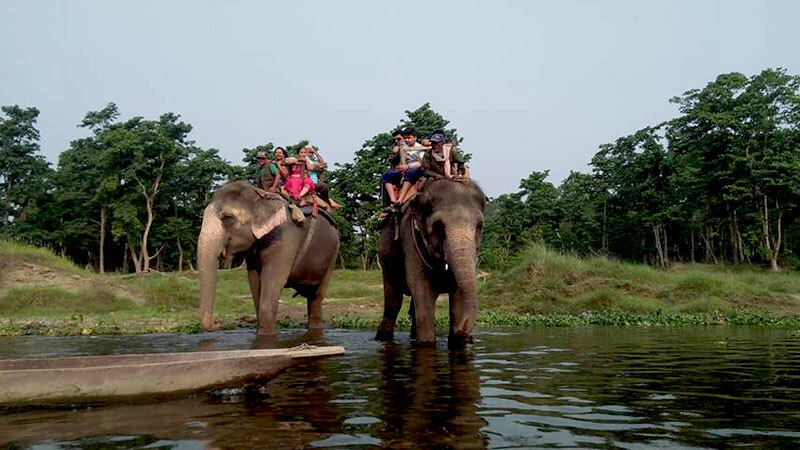 Afterwards, drive to Chitwan National Park to experience the jungle safari in Nepal. Ride on the back of Elephant and dig up inside the dense forest. Then, participate in nature jungle walk and see the Elephant Breeding Center. Completing the safari, again continue drive to Pokhara. Visit the natural wonders around the valley like Fewa Lake, Devi's Fall, Gupteshwor Cave, and other major attractions. Finally getting all the experience drive back to Kathmandu. Day 06: Drive to Pokhara. Day 07: Pokhara Sightseeing Tour. Take breakfast and you will have free time until 12 noon (hotel check out time). Then, transfer to the international airport for your onward destination. The time has come to say goodbye and bring the beautiful memories with you. Kathmandu, Pokhara and Chitwan Tour Trip finished here! Twin Bed sharing (2-5 star) hotel accommodation at Kathmandu, Nagarkot, Chitwan, and Pokhara. Wants some modification on Kathmandu, Chitwan and Pokhara Tour itinerary? contact us to customize it.